Beyond the heavy glass doors of De Medici lies a wonderland of delight and extravagance. Once inside, wrapped in the cozy embrace of one of the booths, guests are welcomed to linger over an amazing meal and absorb an evening of tantalizing experiences. Under the insistence of owner Salavatore Vitale, many of the signature dishes are still created table-side. The soft rosy glow and intimate ambiance of the dining room is punctuated by the bright flashes of flambéing Bananas Foster and Steak Diane. Specializing in both Northern and Southern Italian cuisine, Chef Ricardo Macias charms the palates of many with his supreme offerings of mouthwatering fare. By serving recipes passed down through generations of Italians, De’Medici caters to guests with deft familiarity and graciously serves up a comforting taste of home. Alongside the bustle of downtown, oblivious to the endless rush of cars and tourists alike, De’Medici occupies its coveted 5th Avenue location with humble pride. The restaurant’s understated elegance with its crisp white table linens and savory scents emanating from the kitchen shamelessly attract the attention of hungry diners. In the heart of the Gaslamp Quarter, this dining establishment offers guests a chance to escape the ordinary as they can be transported through its thick glass doors to another plane of time. With specializations in both Northern and Southern Italian dishes, as well as a foray into steak and seafood offerings, De’Medici provides patrons an opportunity to sample the many different faces of authentic Italian cooking. With our heels clicking lightly down the street, my companion and I approach the entrance with nothing short of giddiness. Grasping the large brass handle, we push the doors open and enter noiselessly into a small receiving room. Suggestive of venues on the East Coast, where winter weather encourages guests to escape the cold, we appreciate the front room and momentarily examine the small wooden host desk and thick reservation book. Looking up, we are greeted immediately by the smiling face of our hostess and are introduced warmly to General Manager Mario Valerio. His gracious manner and friendly demeanor assures me that our evening at De’Medici will be nothing short of extraordinary. Exiting the foyer, we are bathed in the rosy glow of soft lighting and simple splendor. Occupying a larger space than would appear from the outside, the walls and high ceilings are covered with lightly sketched frescos. Situated in the back left corner is the bar, where the soft hues of green and blue light scatter on the walls and glitter off an impressive display of liquor bottles. Tendrils of curling ivy cascade from elevated wall sconces and small, intimate tables grace the front of the floor. Situated grandly under the impressive wrought iron and crystal chandelier is an enormous curved dining table. Reminiscent of past holidays enjoyed at home with the family, I cannot help but imagine how an evening spent around its circular expanse would create an unforgettable night of memories. Awoken from my momentary daydream, I slide sideways into the large semicircular embrace of their grand presidential booth. The table is covered in a heavy white cloth and silver chargers gleam invitingly at each setting. Our server, Juan, comes over and introduces himself. Friendly and attentive, he takes our drink order with a practiced air and makes his way towards the bar. As I finger through the menu I discover the variety of dishes offered by Executive Chef Ricardo Macias. I take my time perusing the extensive pages, glancing up occasionally to watch the bustling front room and beautiful banquet area. Catching my eye, as I survey the room, is a large wine aerator being utilized at a neighboring booth. Tall and stately, the graceful arch of its silver neck supports a triangular reservoir that nests a small crystal globe. As I watch, the server artfully uncorks a bottle; and holding it aloft, pours a thin stream over at the bulb, which now I see is filled with water. This, he explains, chills the wine to the perfect temperature as well as enhances its bouquet. As the entire bottle quickly fills the contraption I marvel at the novelty of a table side service that they have so cleverly turned into a show. Turning back to the menu, my guest and I decide on an excellent sampling of dishes and smile as our drinks are quickly brought to the table. I sip my cocktail and enjoy the sensation that only a crisp, clean Tanqueray martini can produce. A touch of vermouth and a wash of juniper berries clear my head and only give way when overpowered by the briny tartness of the skewered olive I pop into my mouth. Looking over at my companion, I see her sip a shining flute of Prosecco. It glows golden in the rosy light and tiny bubbles snake their way up the sides of the glass. Accepting a taste, I find it cool, refreshing, and exceedingly dry; the lemony flavors dance on my taste buds and delight the senses. As the appetizers are served, I gaze at the vibrant colors and exceptional care put into each dish. Looking down, I carefully inspect the overlapping slices of tender Beef Carpaccio placed invitingly on the plate in front of me. Arranged in a circular fashion around a small pile of julienned arugula, they are finished with a light dressing of truffle oil and a generous sprinkling of capers. Agreeing that the quick crack of pepper offered by Juan is the perfect addition; I slide my fork under one of the delicate medallions and admire its beautiful pink color and scent. I sigh as velvety, beefy flavor overwhelms my palate and the heady aroma of truffles fills my nose. The fine marbling of fat that I first observed when the dish arrived becomes even more evident as each bite of meaty, salty goodness melts almost instantaneously on my tongue. The peppery spiciness of the arugula and the explosive pop of each caper add a well-appreciated freshness to the dish. Slowly savoring the last bits of beef, a steaming bowl of Minestrone soon catches my attention. I place my spoon into the hot, thick soup, and scoop up a generous portion of carrots, onion, and zucchini. I bring the rich broth up to my lips and gently blow it cool before carefully taking a taste. The pungent aroma of garlic and spices envelopes my senses and transports me to childhood memories of a cozy winter evening spent at home. Savoring the earthy undertones and layers of flavor, I understand why minestrone means “the big soup.” It is not only full bodied, but also built upon a classic mixture of seasonal vegetables and kitchen staples. As I sip the delicious last drop of soup, Juan appears wheeling a small cart upon which sits our Salad De'Medici. White pillows of mozzarella, creamy avocado, woody hearts of palm, and fresh arugula sit in a bright pile on the small clean plate. Accompanying the dish are two small vials of balsamic vinegar and extra virgin olive oil meant to dress the salad. Carefully applying a light drizzle of each, I eagerly dive into the crisp green leaves and tender cheese. The mozzarella is farm-fresh and creamy, while the hearts of palm add an interesting contrast in texture. Small shavings of parmesan add a welcomed element of salt and also serve to season the smoothness of the avocado. Finally, the acidity provided by the tang of balsamic vinegar is the ideal component to finish the dish. Gliding over, our server arrives bearing a circular white plate filled to the brim with steaming Lasagna and Marinara Sauce. The plate is hot to the touch and covered with a dash of green parsley. Crumbly islands of Parmesan cheese melt slightly into the top of the pasta as I carefully trim off a corner with my fork. Cautiously sampling it, I find that the pasta is still al dente, filled with luxurious ricotta and stringy, melted mozzarella. The exhilarating flavors of tomato and basil rush onto my tongue and combine beautifully with the rich cheeses. Although the flavors of the vegetarian lasagna are already wonderful, Mario brings out a small bowl of slow cooked, Bolognese sauce as a happy addition. He lovingly explains the history of the sauce and how it was created by the grandmother of restaurant owner, Salvatore Vitale. This particular recipe was handed down through generations of Italians, he says, until finally it was perfected by Vitale’s grandmother and served every Sunday as a family tradition. The sauce combines beef and veal with tomato, spices, and garlic to create a mixture that is both-full-bodied, rustic, and hearty. Such deep flavors and excellent texture can only be obtained through the long process of careful slow cooking. Already content, our anticipation heightens as the promise of sampling the Chef's signature dish, the Sole Portofino, is now at hand. Baked to a crisp golden brown, the sole is stuffed with a velvety mixture of lobster, crab, and shrimp, and is served with sides of steamed asparagus, creamed spinach, and cinnamon-scented baby carrots. The carefully piped ring of mashed potatoes on the edge of the dish makes for a plate that is both visually stunning and delicious. Breaking into the delicate filet, I am rewarded with forkfuls of flaky fish and luscious, creamy lobster. The firm consistency of the accompanying vegetables is a perfect foil to the savory, tender nature of the sole. The Ahi, ordered by my companion, provides a complete change in flavor and balances our selection wonderfully. Straying away from the creamy, heavy richness of the lobster, crab, and shrimp stuffing, the tuna is plated upon a bed of Arborio rice prepared in a risotto style. Upon the first cut into the steak, we find that the inside is still beautifully pink and moist. With tiny black and white sesame seeds crusting the exterior, each slice of buttery and tender Ahi is a stimulating lesson in contrast and texture. 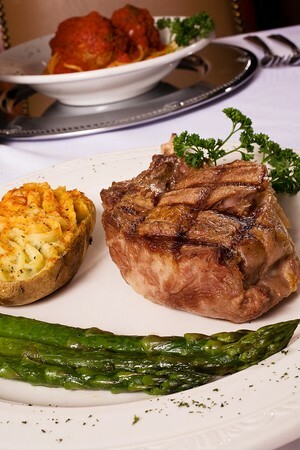 Seared rare, this 8oz steak is accompanied by grilled asparagus brushed in extra virgin olive oil, and is served with a side of a hoisin-based glaze. 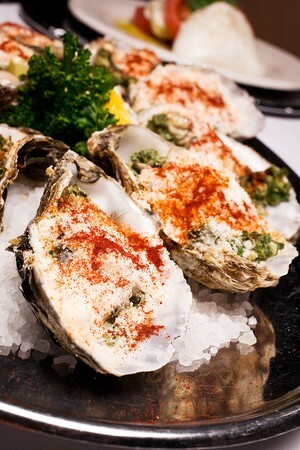 With this, diners are introduced to an even more complex palate. Once paired with a sip of Prosecco, the addition of citrus and bubbles evokes yet another layer of flavor and enhances the dish’s already refreshing notes. Satiated by a delicious surfeit of food and drink, I am surprised that I still have a desire for something sweet to finish off the meal. Taking up Mario’s recommendation, my guest and I order the Strawberries Martinique and are rewarded with an excellent tableside show. 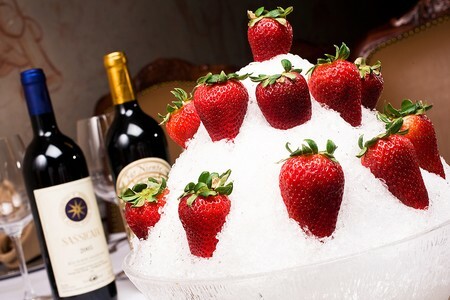 Our server Juan arrives bearing a large bowl filled with a mountain of shaved ice and fresh, long stemmed strawberries. He wheels a cart tableside and proceeds to demonstrate his talent for showmanship. Holding up a large silver bowl, he whisks together brown sugar and cream into a smooth billowy cloud. Then, picking up a bottle of Myers Dark Rum, he winks mischievously and adds a fair amount into the mixture. Still whisking, he streams in Orange Curacao and completes the concoction with a generous measure of Gran Marnier. With a grand show of long pours and smiles, he carefully fills two crystal stemmed goblets with cream, and watches with pleasure as we dip in the fruit and take our first bite. Dazzled by the playful nature of the dish and appreciative of its cool smooth consistency, I am amazed at how the alcohol enhances the nature sweetness of the berries. Light, airy, and fresh, the strawberries and cream is a whimsical adult indulgence that combines the pleasures of an after dinner drink with fruity dessert. With dessert quickly finished, I lean back to luxuriate in comfortable afterglow of a wonderful meal. Resting my head against the tall leather back of the booth, I am surprised to see Mario making his way over to our table. Holding out a frosted bottle of canary yellow liqueur, he places three tall crystal shot glasses on the table and fills them with sparkling Limoncello. He explains how it is customary in Italian culture to enjoy a sip of the palate-cleansing liquid at the end of the meal. More than happy to accept, I hold the glass up and toast; remembering all the lovely events of the night and thankful I could spend them with such welcoming company. The flavor is bright and clean with a warm citrusy finish. Shaking hands with Mario and exchanging words of gratitude, I slide slowly out of the tall booth and breathe in the lingering flavors of lemon. I float towards the front of the room and once again pass though the wide glass doors. Glancing over my shoulder, I smile as my feet lead me out onto the streets and back into the wild din of downtown. 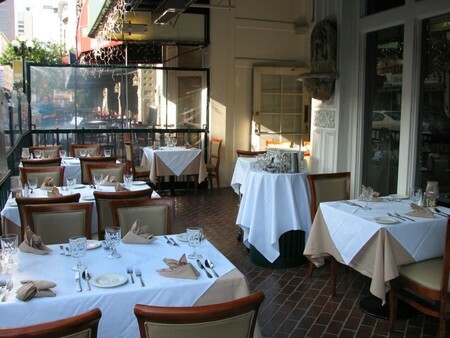 As the sun sets on another warm day in San Diego, the cool green awning of De’Medici catches the last rays of the fading light and glows softly, continually beckoning diners inside with promises of hot food and warm hospitality. Ciao! Corkage Fee: 15.00 | Per 750ml bottle. Depends on Wine. Main Dining Room | Dinner 5 p.m. - 11:30 p.m. Yes, Happy Hour is Monday-Thursday from 5pm-7pm. There are drink specials as well as small bites specials. 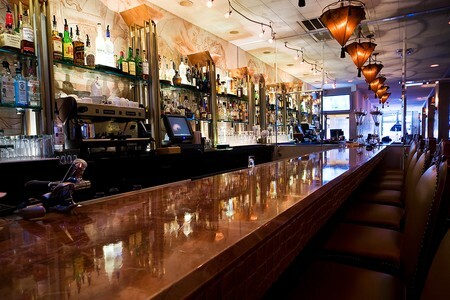 Yes, De Medici does have a full bar. How many guests is De Medici able to seat? 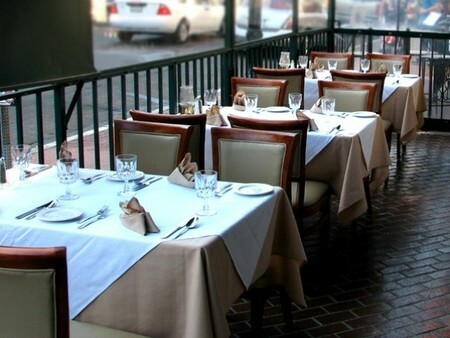 De Medici can seat up to 125 guests in their dining room, as well as 28 guests outside on their heated patio. Do you guys host private parties? If so, do you allow a limited menu? Thanks! Yes, the restaurant does host private parties. There are a few different menu options. Please inquire with us for more details. Daily: 5:00pm-Close. This is a sample menu only. Prices and availability may be subject to change. Provimi veal shank oven baked in a light tomato and chianti wine sauce, served on a bed of aborio saffron rice. Served on Friday & Saturday only. Monday-Thursday: 5:00pm-7:00pm. This is a sample menu only. Prices and availability may be subject to change. 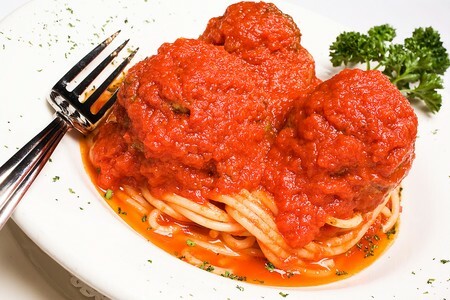 The food is great, maybe best Italian restaurant in San Diego! De Medici does not need my kind words to validate it's perfect presentation, I can only agree heartily with what so many others have already said. The food is exquisite and an excellent value. The entire staff is polished and professional yet friendly and makes you feel like family. We have just begun to explore their amazing dishes. The minute you walk into this restaurant, you know your dining experience is going to be a good one. The ambience is warm and elegant, and the service is outstanding. The menu has something for everyone and is prepared wonderfully. This is an expensive restaurant, but worth every penny. We can't wait to go back. Wow, what an awesome place to eat. We walked around the gaslamp district (not too impressed), and we looked at many menus on the way. We decided to try De Medici as it had the most extensive menu. Am I glad we did. The food was fantastic, the waiter gave us all the time we needed and that has to be the most reasonabley priced wine list I have ever seen (and we travel a lot). Very good wines were affordable. No ripoff there. The food was the best we had in SD. Just a little loud as there were so many people there on a Tuesday night (8 p.m.). Man o Man, when we go back to SD, we are going to make a bee line for De Medici. Everything we ate (party of 5 so we had a wide selection)was great. If you go to SD, go to De Medici, you will not be disappointed. 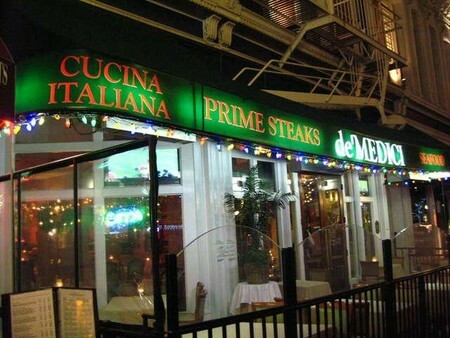 I've been to De Medici's a couple of times and both experiences were excellent! The prices -- worth every dollar spent. The service -- attentive. It's a great place! Give it a try, you won't be disappointed. One of best Italian restaurants in San Diego. The menu choices are extensive and exciting - you'll have a hard time choosing because probably several items will have great appeal to you. Don't worry, though, I've had this dilemna several times and have always been ecstatic when my choice arrived! The service is outstanding and the waitpersons have just the 'right' touch of attentiveness and timing. I entertain there frequently with business clientel and de Medici has never failed to impress and please every member of the party. My wife and I had dinner at deMedici Saturday 12/13 and could not believe how we have missed this downtown gem. From the time we walked in until we left we were treated like long-time customers. Our Caesar salad was prepared tableside from scratch by Juan, our captain and was the best we have ever tasted. Juan guided us through a memorable evening that included sole portifino (stuffed with crab and shrimp) and a veal marsala that melted in my mouth. A wonderfly light tiramisu capped off a truly great dining experience. The staff is professional,unobtrusive but ready and very friendly. We will be returning soon. The food and service was simply wonderful. Tableside preparation of food was a show in itself and tasted as good as it looked. Can be noisy if there are crowds, so be prepared and ask for a table along the outside of the room if you want to have a conversation during dinner. This is a "not to be missed" stop in the Gaslamp district. Spectacular view, great food, great service, great everything. GO! Wow! We just celebrated someone's birthday there on a Monday night. We made reservations for 6:00, which was great for conversation (room filled up in about an hour). The service was the best I had ever experienced! (I eat out a lot!). The food was excellent. Everyone was completely satisfied. For our birthday guest, the waiters brought out the cake we had brought, placed candles on top, and sang "Happy Birthday" in Italian. They had great voices too! I would totally recommend this place! Great atmosphere, food, and service! Dining at De Medici's is among the best experiences I have had in San Diego. Food and service is by far a five star rating, why does it hold only one star on your rating when your service/food is "excellent"? Prior to dining at this restaurant we looked at all of the reviews and felt that this place could not possibly be as good as everyone had expressed in their reviews. We were wrong as this was the best restaurant experience we have encountered in San Diego. The staff was outstanding and the food was excellent. Our waiter, Jason Burke, was like a culinary guide as he led us through the various courses of our meal starting with his special Ceasars Salad created for us tableside. To say the entire staff there was attentive would be a gross understatement as they saw to our every need and did it in a friendly manner. As Arnold would say,"We'll be back!" My boyfriend and I went there last year for New Year's Eve. The service was exceptional, professional, efficient, and flawless. The food was wonderful. The ambiance was classy, elegant, romantic, and warm. Their Caesar salad was the best I have ever tried. This is a wonderful restaurant for special occasions. This place was so beautiful. My boyfriend and I love to eat seafood. 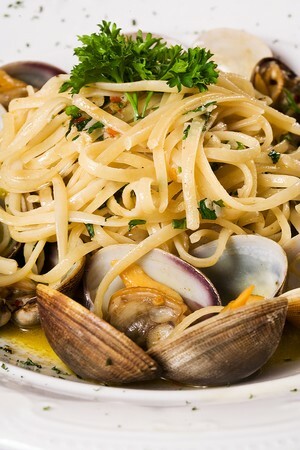 De Medici offers the best Italian seafood. Our waiter was very attentive and recommended the best wine for the food. We will definitely go back. Perfect! Perfect! My Wife and I just celebrated our 6th anniversary here and it was an excellent choice. Since we were received by the hostess with an 'ear to ear' smile, we noticed that this was a very different kind of place, the attention and kindness of everybody is incredible! Our waiter also received us with a '10 score' attention and he knew the answers to all of our questions regarding food preparation and wines (which I have to say you can't find everywhere) The soup and the main course were excellent and we closed the dinner with a delicious dessert. So I must say this IS a place worth visiting! Great casual atmostphere. FANTASTIC Food!! I had the sole portofino. I cleaned every bite off the plate. Very friendly and curteous waiter. They bring a platter with different steak you can choose from. great touch! Will definitely go again! We ate here for New Year's eve dinner '05. Outside of restaurants I ate at while in Italy, this has to rank in the top three best meals I've ever had. The atmosphere was calm, elegant, classy and quiet. They had Dean Martin music playing at a soft volume so you could hear it in the background, but it didn't conflict with your conversation. The waiter was fine, the food was spectacular! First, the only small negative I would give is that the bread was very 'standard' for such a fine restaurant. I would have rather seen a selection of interesting breads and breadsticks and dipping oils. But, that said, it's best probably not to fill up on bread here.... you'll want to save all the room you've got for the main food and the fantastic desserts. We had the eggplant appetizer that was pretty darn good. We also had the canneloni appetizer stuffed with lobster, crab and shrimp. If you have a heart condition, you'd better bring your paddles because this is so good that it may just stop your ticker right then and there. This was fabulous! Usually, if I'm at an Italian restaurant, I'll order something more traditionally italian for a main course, but this time my girlfriend and I shared the massive (18 oz.) rib eye steak. This is more than mere meat.... it was the best steak I've ever had. It comes with some potato thing and green beans.... (six... count them... six beans. Okay, that's two negatives.) The dessert tray kept going by and I decided that no matter what, we had to have some of that.... and man, was it good! We got creme bruleé, which was good, and the taramisu (sp?) which was killer. Wow, what a great dessert that was. I am going to take my mom here for her birthday.... I will try some different dishes, but if they are as good as what I had the other night, then this will definitely be one of the restaurants at the very top of my list. Without a doubt, you would be well advised to try this place. Makes for a nice, romantic dinner. 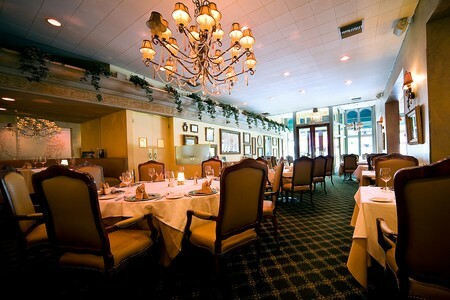 De Medici was a quiet and romantic restaurant perfect for couples. My girlfriend and I ate there recently and between the two of us we had the Melanizze Eggplant, Minestrone, Spaghettini Pomodoro and the Fettuccine Alfredo. The portions are just the right single serving size. We were not feeling very adventurous so we stuck with food we have ate before. But the menu is very extensive offering a plethora of different entrees. The only bad mark on De Medici is the servers are very soft spoken and awkward when explaining menu items. 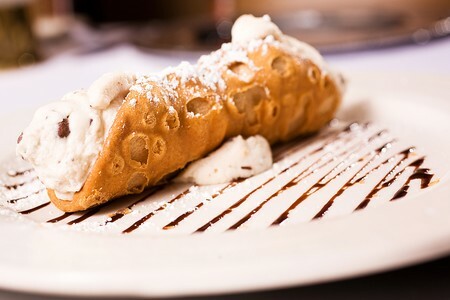 All in all De Medici is definitely one of the best Italian restaurants in San Diego. We ate at De Medici last night for the first time. Everything about the experience was positive. From making the reservation to finishing our dessert and cappuccino, we thoroughly enjoyed ourselves. My wife had the Risotto ai Frutti di Mare which had the tenderest calamari I have ever tasted. I had the signature dish, the Sole Portofino, which I would highly recommend. Our booth was comfortable and gave us a great view of the restaurant. The waiter, Frank was excellent, in both attendance and in timing. All in all a great dining experience for a couple looking for a great meal and intimate setting. My wife and I go to De Medici's on special occassions only. It has been 7 months since we were last there and it was just like we remembered 2 year ago. The service is excellent, the food is outstanding. Highly recommend De Medici's! At the end of October we were in SanDiego to join a cruise ship. We were a party of 8, 6 Brits and 2 Americans. The food, service, and welcome was of the highest standard. The restaurant was well up to the best standards in London and New York. I took my baby out to dinner last week and I was wanting something romantic with good food. My reservation was for 7pm and had gotten there early. The staff was very nice and the atmosphere was very romantic. I was very pleased with the way the place looked. Me and my girl sat at a booth in the center of the restuarant. The lighting was just right with candle lights at the table. The music was soft and classical. The dinnerware was fancy and the waiters were very knowledgable with what was on the menu. Everything was written in Italian. Me and my date werent sure what wine to have with our dinner but we allowed the waiter to pick. I dont remember the name of the wine but I had never tasted a wine so good. It was the perfect place and it was a night that Ill never forget. I spent just over $100.00 for two meals with an excellent choice of wine. It was pricey but well worth it. This place is great to take someone you love. De Medici was a wonderful dining experience all around. The atmosphere set the impression of elegance and held an aire of old Italy. In short, it was the perfect setting for a quiet dinner for two. One of the most noticeable aspects of De Medici was the excellence of the service. Upon entering, we were greeted cordially and taken promplty to our reserved table by the hostess. Our server, Regina, was very knowledgeable with regards to the menu and wine selection. Warm dinner rolls were brought out to our table immediately and our water glasses were never empty. It was made quiet obvious that the staff was more than concerned with meeting our needs. We ordered the Linguinni fra Diavolo paired with a glass of the De Medici Merlot and the Gnocchi Ponte Vecchio. 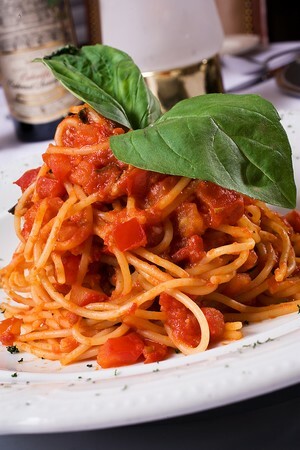 The Linguinni was prepared al dente with a deliciously spicy marinara sauce. The calamari was flavorful and not overcooked (as often is the case). The pesto sauce on the Gnocchi was rich with garlic, in classic Italian tradition, but the pasta "dumplings" were a bit heavy. For dessert, we shared the divine New York style cheesecake drizzled with chocolate sauce and topped with a ripe raspberry. We finished off the evening with a smooth cappucino and herbal chai tea. The entire meal was very reasonably priced and worth every penny. 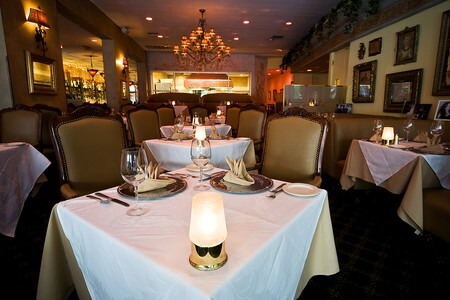 We would highly recommend De Medici for a delicious meal with superb service in a comfortable, romantic atmosphere. Since moving to San Diego, we have been on a hunt to find good food! We had a wonderful experience at De Medici. From the hostess to the waiter to the food, we had a great experience all around! The waiter was very pleasant and made sure we never had a empty glass. he was very honest and answered our questions and helped us choose great meals. The portions were perfect sizes and very tasty. We will be back there soon. I took my wife to De Medici's last night for her birthday. I made the reservation through sandiegorestaurants.com with a note mentioning the occasion. That was enough to warrant a man in a suit opening the door for us, a "happy birthday" from the attendant at the computer, and a very comfortable, elevated booth seat. We also received a complimentary piece of delicious tiramisu with a lit sparkler for desert. The dimly lit dining area was extremely elegant with wall paintings, chandeliers, and plant life. We were immediately given water and a wine menu. My wife loved the chianti. I only drink water, but my glass was refilled nearly every time I took a sip. Bread and butter was brought out while we looked at our menu. It was warm, soft, and delicious, and replenished every time we grabbed a roll. I hesitated to order a salad when I saw the price of the Caesar, but it was well worth it after the dressing and salad were prepared right in front of our table, found to be extremely appetizing, and in just the right portions for the two of us. I ordered the scampi vesuvio and my wife the agnolotti alla panna. I've never seen such large jumbo shrimp. The presentation was flawless. I had to try my wife's. It melted in my mouth...and such delicious cream sauce. Again the portions were perfect, filling us completely with no leftovers. Fresh grated cheese was offered with everything. I don't know how we fit the tiramisu in, but one piece was enough for the both of us. I've never had a better piece of cake. My wife has visited Italy on a couple of occasions, and actually resided there for a short period of time. In her opinion, De Medici was of better atmosphere, quality, and selection than any restaurant she's ever attended in Italy. De Medici features a superior staff, delicious food, and fair prices. I tipped generously and stayed right on budget. Our full meal with wine was under $90. De Medici is such a great find in the Gaslamp. Delicious food and the service was impecable! Making a reservation through SDRestaurants.com made the dining process seemless and with no wait! The menu has a great selection at varying price ranges which was nice for our large group. I highly recommend the "pasta pillows" as they were so light and yummy! My Wife and I had our 9th Anniversary Dinner here and EVERYTHING was wonderful, we have children and usually do not have many opportunities to go out to dinner alone, I chose this restaurant after checking out the menus and plan to go back again when I can. Our Server and busboy were very attentive without being annoying. The menu is huge and it was hard to choose, I wanted everything, our server made exellent suggestions and we were impressed with his food knowlwdge. We were offered a booth or table (nice to offer), the table settings are very nice and the ambiance was plesent.. I would highly recommend this fine dining establishment to family and friends. Thank you De Medici for a happy anniversary dinner! Wait staff is VERY attentive and the food is incredible. The atmosphere makes it feel like if you looked at the table next to you, Sinatra might be seated there. My wife and I had a wonderful meal at De Medici. The wait staff was very accommodating, friendly, and happy to serve. 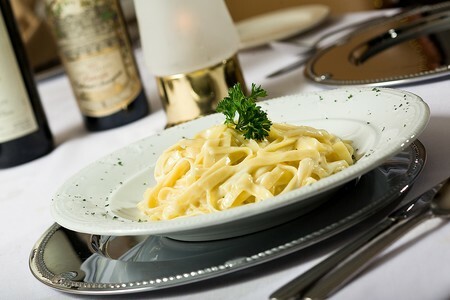 The food was exceptional, we have recommended De Medici to many friends and family members already. This place is a don't miss! The food was amazing, fast service, beautiful ambience. Best Italian seafood in town. I will return. If you want the best American ciusine in San Diego, this is it! Having been born and raised in San Diego, I know the restaurants well. There are many good ones but this one beats them all. They have everything you could possibly want on the menu, and it's ALL good! The service and atmosphere is excellent and relaxing. The waiters know their stuff and many dishes are prepared at your table. I've never had anything there that I didn't like. The old chef from the "Star of the Sea Room" on the wharf brought his dishes there many years ago so if you like fish, this is also the stop for you. It is the best restaurant in San Diego, hands down! Dr. B. Great place for romantic dinner. Service and food were both great! By far one of if not thee best places to enjoy the slpender that is Italin cooking. Atmosphere and all, I felt as if we were in una casa di familiari. Would recomend De Medici to anyone who would also want the same experience. was a great experience and I would defintely eat there again! Best place in San Diego!!! Called ahead and told the hostess that I would eating there after I proposed; I didn't get the atypical San Diego service response of, "why do I care?". She immediately went through some options and when I showed up there was a bottle of champagne on the table and we were seated at an elevated booth with a view of the whole restaurant. Juan, our server, provided perfect service. Definitely a great place to bring a group for great food or to impress a date. Hurry....take your wife, your boss, your friends ! If you love great service paired with exceptional food in the traditional style this is the place for you. We happened to order the tableside preparations of Ceasar Salad and their sumptuous Bananas Foster plus had bottles of wine decanted and it's like watching a Vegas show. This was a "business" dinner and our clients thought this was one of the more memorable meals in a long time. Big favorites were the swordfish carpaccio and good 'ol spaghetti and meatballs (mixed with filet mignon !). Absolutely delicious, with incredible service! Could not have picked a better spot. Thank you De Medici. Our dining experience at De Medici was nothing short of spectacular. The entire staff was very polite and our waiter Juan made the evening all that much better. The Caesar salad made to order at your table was an event in it's self not to be missed.The main course was beautifully prepared and well presented. I look forward to dining at De Medici in the future as this is one of the best dining experiences and best meals I have had in quite some time. Great food and excellent service. A little pricey, but overall it was worth it. Very nice atmosphere, fitting for the pleasant Italian cuisine they served. Service was impeccable! We sat outside, I'm sure seating inside would be more appealing for a romantic couple. Food was good, not INCREDIBLE. The service at the restaurant was awesome. However, the waiter forgot to tell the chef to leave out the hot pepper flakes on our son's pasta, therefore, it was TOO hot for him. The waiter did offer to take it back. That is why I'm giving this restaurant a high ranking. 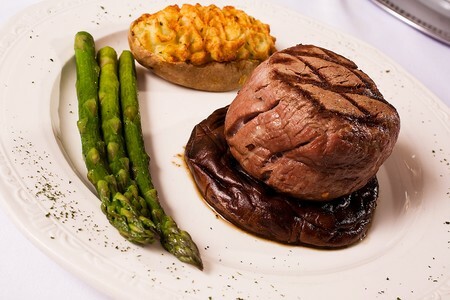 The filet mignon (special of the night) was the best that I ever had. oh my! this restaurant I've got to say this is the best italian and san diego. great service and food. desert off the hook!!!!!!!!!!!!!!!!!! Wonderful food and service. Our experience was great here. 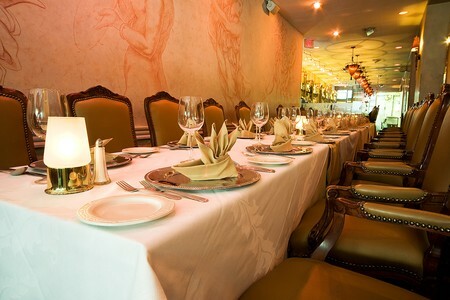 De Medici is a very romantic and ambiance rich restaurant. The service is good and the price is not too expensive. Over all if you are looking to impress your date: great place. Hands down I had the best gnocchi, pesto sauce and tiramisu ever here. I even enjoyed my mom's stuffed sole fish and I generally steer clear away from any type of fish. However, they put the mashed potatoes in a frosting tube to display it nicely around the fish. This results in crisp edges of mashed potato that I don't find appealing with this style. My sister had a NY steak. The sauce was not tasty and the steak was average. My family loved the table side making of the caesar salad and the waiter's explanation of each ingredient and the history of the creation of the salad. However, two people have to order it and it is $15 per person for a side salad. Another cost issue, we were charged for each soda refill ($3 ea). I'm a Diet Coke fiend, so didn't care too much for that. The atmosphere is beautiful. High back seating is exquisite. We were celebrating my sister's 17th bday so the hostess saved us one of the beautiful booths. The hostess was a real delight too, very sweet. The music was mostly Frank Sinatra so that was an added perk. The food, service and ambience were delightful. Will definitely dine here again. I have eaten here three times and always enjoy myself. Some of the main courses need a little work, but the service and ambiance are so nice, the wine selection so thorough, and most of the food so good, that you forgive a few imperfections. My husband and I had a great experience here on our one year wedding anniversary. They surprised us at the end of the meal with a delicious Terimisu for desert. Thank you for a great meal and experience! Date Night with the Wife!! DeMidici lived up to its romantic atmosphere. We had a great time in a quiet setting with excellent service. Our server (Paco) was very attentive and took very good care of us. We started off with the Calamari (it was ok) and we also had the Lobster Bisque (very good). The main course we chose were the Linguini Pescatore and the Shrimp Vesuvio Linguini. They were very good portions and tasty. The scallop in the wife's meal was a tad undercooked, but she was able to cook it through by burying it in her noodles as it was at very good temperature. We topped off the night by sharing a Creme Brulee (outstanding!!). The entire meal plus a glass of wine ran $110. Overall a great night! Excellent, knowledgeable And attentive service with a touch of humor. Food was relish! We would recommend and be sure to go again when we visit. The waiters were exceptional...they made sure we had a good time. Food was fine. Buyer Beware: Unfamiliar with Gaslamp District? Paid $17 to valet park at De Medici on 3/31/07 (Saturday night). Not a great way to start the evening. Otherwise appetizers and entrees quite good, dessert (floating island) mediocre at best ($9). Service disappointing: Brought our own wine (corkage $15). Our waiter insisted on decanting a young merlot "for the presentation" after I had asked him to skip it; also corrected the pronounciation of one of our members after he had pronounced the word (farfalle) correctly. Service was also slow. I will say that the restaurant itself is very attractive. Maybe another night in the week would be a better bet. Linda from L.A. I had initially cancelled the reservation, but my 2 friends and I went down there anyway. We had flown in earlier that day, and ate about 6pm. There were not a lot of people, but we had to flag down our waiter for bread and water replacements. My companions were not very hungry and just ordered pasta. Maybe that is why we were not noticed. I started off with the cappicio (sp?) which was wonderful. Very flavorful. I then had the Seafood Portifino. The waiter told me that it was their signature dish. It was good, but not the best seafood dish I have ever had. Not bad, but for $26 + I would have expected a little more flavor. The $10.50 Crown and 7 coctail had about 2 good sips in it. Too much ice. We ate outside, and it was a nice evening. I can see why some folks complain about the parking, but it is like that all around the Gaslight area. I would say a 3 star experience. Not bad, not great. Thanks. If you come from a fresh seafood area like i do, Seattle, Portland, SFO, you expect fresh fish, cooked in real time. We were heavily pushed into the expensive highly-touted specials, as most restuarants do, by the friendly staff. Don't bite. The Portofino Sole (the so-called signature dish must be made pre-prepared by the hundreds and slapped in a convection oven. For $37, its a joke. It was good, but no award winner. The Chilean Sea bass tasted a lot like garden variety red snapper to me. No texture, no flavor, disguised with a strange sauce. I should have stuck to the pasta. The side of spaghetti with marinara for $8 was the best thing we had. Dinner for two without wine ended up over $100. Probably market-priced for a tourist area, but way overpriced from any kind of value point of view.! On the plus side, ambience, service, excellent. The staff is everywhere. The gaslamp district serves thousands a night, as fast as they can. Don't expect 5-stars in that kind of environment. Can most people really be fooled into thining pork is veal? Is lobster soposed to really have a mushie textre? Is this what I get in a tourist area? I'm sorry, but I'll never try again. I was really looking forward to dining at De Medici and was surprised at both the quality of food (pretty mediocre) and VERY pushy service. I didn't want several appetizers and a whole bottle of wine, and the server wouldn't take no for an answer. On the plus side, the ambiance was very nice and the dessert was great! Our waiter didn't seem to really listen to what we were saying while were there...we were asked more than once if we wanted our salad with the appetizer.. I recieved the wrong entree, asked for more bread and never recieved it. While eating the bread we did have the busboy took the butter away with the empty bread basket even though we were using it. The arugula salad might as well have been weeds from my backyard... no flavor whatsoever. Sorry, never again. WE WERE WARMLY WELCOMED AND SEATED. THE STAFF WAS PLEASANT. DIFFICULT TO READ THE MENU SINCE IT WAS QUITE DARK. THE INSALATA CAPRESE WAS DISAPPOINTING. NO FLAVOR(WHEN TOMATOES ARE NOT IN SEASON, FLAVOR THEM) THE CANNELONI WERE WONDERFUL. DELICATE AND THE FISH WAS TENDER. THEN THE DISAPPOINTMENT----MAIN DISHES. WE HAD THE RISOTTO AND THE LINGUINI PESCATORE. THEY WERE THE EXACT SAUCES- ONE OVER RICE AND THE OTHER OVER LINGUINI. BEING SO DARK, I COULD HARDLY TELL WHAT I WAS EATING BUT REALIZED THERE WAS 1 SHRIMP( TOUGH AS RUBBER) CALAMARI AND BLAND FISH SURROUNDED BY CLAMS. THE SAUCE HAD NO CHARACTER, NO FLAVOR AND NO GARLIC. HOW COULD THEY USE THE SAME RECIPE FOR 2 DIFFERENT DISHES? BEING ITALIAN AND WELL TRAVELED, I AM FAMILIAR WITH GOOD ITALIAN FOOD. THIS WAS NOT! THE CANNOLI WAS WONDERFUL AND THE COFFEE VERY GOOD. FOR $150.OO MEAL, I PREFER THE MACARONI GRILL. Our first experience at DeMedici's was excellent. You couldn't get more attention than we got that first night. Not so this last outing. Poor service, the food was fair at best. That is why as the old saying goes "You can never go back" and we won't. I took 8 people to celebrate my husband's achievement .Everyone was excited to try this famous Italian restaurant ,rated 4 star in the guide book.Well first of all they pushed steaks( expensive American food), and most of us ordered Italian ..quite frankly it is nothing out f the ordinary ...Then dessert.They brought a big tray and no one was hungry due to jet lag and we didn't order .They lingered for a long time ,hoping some more business out of us.Wine wine was fine. For an ordinary Italisan food with small portions and nothing special ,$500+ is too much . Red Lobster would've been better. If you want to gamble whether you'll have an "ok" dinner experience or lose $195 ($240 in my case) then try De Medici. The more cash you lay on the table the better your chances the management will throw a waiter in training at you. BAD experience, still upset after 5 weeks. I took my Husband to De Medici for our anniversary last night and had the worst service I have ever had. We were not told the specials unlike everyone else, never asked if we needed anything, had to flag down the manager in order to get things and to top it off waited an hour and a half to receive our dinner. I do have to say that the food was good but I would never go back because of the horrible service. Way overpriced and the food was insignificant at best. Read all the reviews before I went and now I wish I hadn't. The waiter left us their for a long time he said he would get me a drink and took 30 minutes our food took two hours it was cold , the waiter was just horrible. the owner was intoxicated, and it was to crowded.